Euan combines classical technique with mastery of the jazz piano tradition. In the corporate arena, Euan has performed at world class hotels including The Oberoi in Mumbai and Reid’s Palace in Madeira. Closer to home, Euan’s tasteful playing has created the perfect ambiance at parties and receptions at venues such as Skibo Castle, Gleneagles, The Balmoral, 1 Devonshire Gardens and Holyrood Palace. Top hotels at which Stevenson has performed include The Oberoi in Mumbai, Reid’s Palace in Madeira, and closer to home in his native Scotland, Skibo Castle, Gleneagles, The Balmoral and 1 Devonshire Gardens. He has played for Royalty on several occasions, most notably private dinner receptions at Holyrood Palace for Prince Charles. He has performed his own compositions and arrangements on BBC Radio 3 and BBC Radio Scotland as well as numerous live concerts in The Glasgow and Edinburgh International Jazz Festivals. 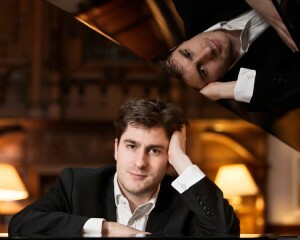 The Euan Stevenson Trio is arguably the most authentic, swinging jazz piano trio working in the UK today. With tight knit, dynamic arrangements, the trio is renowned for its uncanny ability to capture the energy and spirit of the popular piano trios of the 1950’s and 60’s. Much in demand by jazz singers and instrumentalists alike, the trio has performed extensively in theatres and jazz venues throughout Britain.